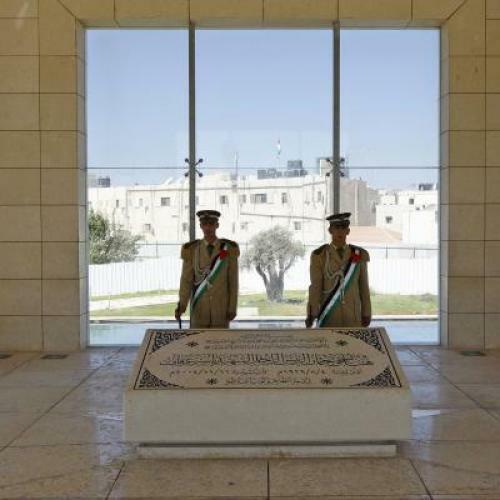 On Tuesday, the body of Palestinian Liberation Organization leader Yasser Arafat—who died in 2004, apparently from a stroke—will be exhumed and samples of his tissue collected to determine whether he died of poisoning. The inquiry is being opened at the behest of his widow, Suha, after Al Jazeera oversaw a nine-month investigation into the circumstances of Arafat's death and concluded that he may have been killed with the radioactive element polonium (his toothbrush and keffiyeh reportedly turned up high levels of radiation). According to CNN, the Palestinian Authority is prepared to blame any evidence of foul play on Israel. Such post-mortem prodding is not all that uncommon. Disinterring the rich or famous to look for clues about how they died, or to double-check their identity, has long been a passion of the living. Here are a few of history's more curious exhumations. The reason: Historians almost all agree that the 12th president of the United States died of an intestinal disorder. But in the early ‘90s, citing the grave political threat that Taylor, who favored containing slavery, posed to pro-slavery Southerners, novelist and former University of Florida humanities professor Clara Rising proposed that he was assassinated. Eventually, she convinced officials in Kentucky, where Taylor is interred, to authorize an exhumation. Conclusion: A little more than a week after taking hair and toenails from Taylor’s corpse, Kentucky medical examiners ruled out poisoning and speculated that Taylor indeed died of violent gastroenteritis. Taylor’s body having already been sealed into his tomb, it was left to his descendents to decide what to do with the extra toenails. The reason: The outlaw Jesse James officially died in 1882 when fellow gang member Robert Ford shot him, and his body was buried in Liberty, Missouri. But in 1995, a man claiming to be James’s great-grandson concocted a different theory—that James faked his own death and lived until 1951 in the remote outpost of Granbury, Texas, where he died under the name J. Frank Dalton, at age 103. Conclusion: Even though James’s descendents’ DNA had been matched, in 1995, to the body at rest in Missouri, Dalton’s remains were exhumed for testing five years later—or so researchers thought. In fact, Dalton’s headstone had shifted over time, causing researchers to unearth the wrong body. If the real Dalton was ever subsequently exhumed, and his DNA tested, the news was never made public. The reason: For years after his death, conspiracy theorists proposed that it wasn't Lee Harvey Oswald who shot John F. Kennedy, only to be assassinated himself several days later, but a Russian agent on a mission to kill the president who swapped identities with Oswald. To address their suspicions, which were based on medical records that supposedly did not match the deceased Oswald’s description, his widow gave permission for his body to be exhumed and examined in 1981. Conclusion: Pathologists matched features of the corpse to the dental records and medical history contained in Oswald's military records, determining with certainty that the body buried under Oswald’s name was indeed him. The reason: Almost as soon as Fischer died in 2008 and was buried in Selfoss, Iceland, the $2 million estate of the eccentric, globe-trotting chess prodigy turned U.S. fugitive became the subject of a messy paternity dispute. The country's supreme court ruled in favor of Jinky Young, a 9-year-old who claimed to be Fischer's daughter, and his remains were were exhumed for DNA testing. Conclusion: Young turned out not to be Fischer’s daughter, more or less ending the dispute. The reason: Chilean President Savador Allende's cause of death, like Arafat's, was not assumed to be criminal. But the likes of Fidel Castro and Gabriel Garcia Marquez stirred suspicion about the official account—that Allende committed suicide during a coup led by Augustus Pinochet—causing his family in 2011 to authorize a second autopsy. Conclusion: The team examining Allende unanimously agreed that he died by suicide. The reason: Nawaz, Pakistan's army chief in the early ‘90s, died of what appeared to be innocent causes—a heart attack he suffered while jogging. But high levels of arsenic found in his hair in posthumous tests spurred his widow to call for his exhumation and testing ten months later. Conclusion: The doctors who tested his remains found no poison. But to this day, his brother continues to believe that test results show inconsistencies; the Jeay Sindh Qaumi Mahaz secretary general has said that tests actually confirmed his poisoning death. The reason: When George Halas, president of the Chicago Bears and son of the multi-million-dollar franchise's founder, died at 54, his heirs immediately fought over his estate in court. An autopsy had concluded that he died of a massive heart attack, but his ex-wife, noting that Halas had not been diagnosed with any major medical problems, wanted a second one performed. Her motive may not have been certainty, but money: she and her children were beneficiaries of insurance policies whose payouts would double if he had died by an accident or murder. Conclusion: The resulting autopsy was inconclusive, as Halas’s vital organs had been removed after his first autopsy and replaced with sawdust. Halas’s widow and children never filed a wrongful death suit. The reason: Lincoln’s tomb, having been targeted by grave robbers, was reopened twice between 1876 and 1887 to confirm that his body was indeed still in its rightful place. In 1901, to much fanfare, his lead-lined coffin was hacked open a third time, and 23 witnesses viewed his desiccated corpse to make sure it was still there. Conclusion: It was still there. Update 4:09 pm: We told you this wasn't uncommon. Believe it or not, just today, a Turkish national newspaper reported that last month's exhumation and examination of former president Turgut Ozal, who died in 1993, turned up evidence that a poison cocktail may have caused his death. Rumors swirled after Ozal, who was 65, died of apparent heart failure while still president, that a shady faction of the government had assassinated him. The newspaper, Today's Zaman, quoted unnamed sources it said belonged to the Forensic Medicine Institute, which will release its official report in December. Thanks to UT at Arlington Assistant Professor Brent Sasley for the tip.